If you are looking for information on the Knockouts Haircuts For Men franchise business opportunity, Knockouts Haircuts franchises or Knockouts franchising, then you have come to the right place. Are You Looking For An Attractive Investment? Knockouts is considered one of the premier providers for men's haircutting and grooming services in the country. 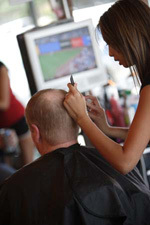 The media has described us as, "first class stylists, and a one-of-a-kind atmosphere for an overall exceptional experience," "a cool concept that integrates the best stylists with a unique and relaxing environment," and "think Hooters, then think boxing, now there is Knockouts - the next level in men's hairdressing." What makes Knockouts unique? Our chosen, attractive FEMALE stylists (Knockouts Girls®) welcome each customer as they enter our arena. Customers wait in our comfortable ringside seats, while watching sports on a big screen television and drinking a complimentary beer, soda, or bottled water. The stylist will then call them up for services ranging from shampoo, scalp massage, mini-facial, manicure, pedicure, mustache/beard trim, hair styling, haircutting, or waxing. A massage therapist is also on staff to provide multiple types of professional massages. Why Become A Knockouts' Franchisee? We are committed to providing our franchisees with the best in support and structure. The following are some of those efforts we provide. Are you interested in learning more about the Knockouts System?